Curubande is a district of Liberia Canton located between district Liberia and Cañas Dulces. There are approx. 2000 people living in Curubande village, it is located 16km from Liberia center. 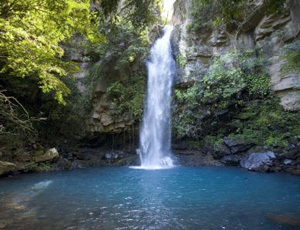 This area is characterized by its impressive canyon and its rolling hills. Thanks to its unique topography there is always a nice breeze. Curubande is famous for its volcano Rincón de la Vieja. The area depends on tourism and agriculture. ICE, the national electricity provider, has put a significant power plant Las Pailas in Curubande. Curubande is an excellent place to live in a single family home on a large land plot where you can enjoy nature. 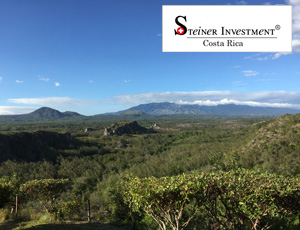 There are some residential areas on the road to the volcano Rincon de la Vieja and some beautiful stand alone homes with spectacular views on the canyon, the valley and the volcanos. This is a good area for hiking, biking or to enjoy one of the activities at Hacienda Guachipelín which offers horse back riding, zip riding, canyoning and much more. © Steiner Investment - All rights reserved.